The Bravo 21 Zone Start is a 21" commercial lawnmower powered by either a Kawasaki FJ commercial engine and has a 2-speed heavy duty transmission that is fastest in its class. The Bravo 21 is a hi-vac rear bagging lawnmower with excellent bagging performance and outstanding mulching capabilities. The high vacuum steel deck design provides superior quality of cut. When the Zone Start safety package stops the blade from spinning the engine is also shut off. The spare parts on this commercial mower are very reasonably priced. Model 21-610 (Kawasaki FJ180V Engine) is equipped with a Zone Start safety package. When the Zone Start device stops the blade from spinning the engine is also shut off. The Zone Start mower is a bit simpler in complexity; therefore the price on this model is a bit lower. Mulch plug included with all Bravo 21 mowers. Kawasaki FJ Commercial Engine: The Bravo 21 is powered by a Kawasaki FJ Series engine. This engine has plenty of power and is well proven in the commercial landscape industry. The Kawasaki engine quality is unsurpassed according to commercial users. Transmission (Patent Pending): The Bravo 21 is designed around our proprietary 2-speed heavy-duty transmission. The transmission is built tough with oversized gears, and with needle and ball bearings throughout. Additionally the “wheel ratchets” that are normally located at the wheels are incorporated inside the transmission to protect them from the rust and grime of everyday use. Cutting Deck: The Bravo 21 uses as its "foundation" a very strong and rigid 14-gauge steel deck. Hardened steel replaceable wear strips protect both trim sides of the deck. Components such as wheel brackets and height adjusters are all "bolt-on" for simple maintenance down the road. Semi-Pneumatic 9” Wheels: The Bravo 21 rides on radial shaped semi-pneumatic wheels. The semi-pneumatic tire has “give” in it to help reduce the harsh bounce caused by the solid wheels on most mowers. The rims of these wheels are made with a modern material that is tougher than steel. The front and rear wheels are fully interchangeable to allow ease of service. Oversized Handle Tubes: The Bravo 21 has 34mm aircraft quality aluminum tubes that provide a very strong handle solution while minimizing weight. Special clamps rigidly attach the handles and prevent the tubes from crushing and loosening. The cables are routed inside the tubes for greatly improved cable protection. No more snagged cables on your trailer or plants! Rugged Front Axle: The Bravo 21 has an oversized 30mm front axle that protects the front of the mower. In addition, the large diameter axle provides a very rigid and strong mounting device for the front wheels. The axle also can be used to lift the mower when needed. Fast Ground Speed: The Bravo 21 has a heavy-duty 2-speed transmission that delivers the fastest ground speed in its class. With the adjustment knob located at the handle, you can easily adjust the drive engagement of the mower to your personal preference. 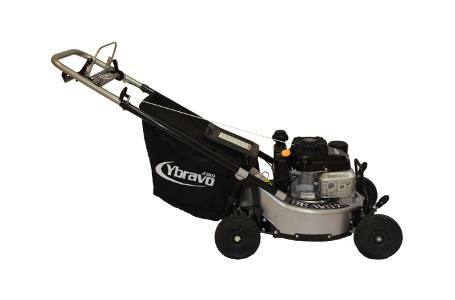 Superior Vacuum Performance: The Bravo 21 has a CAD designed "deep-draw" cutting deck combined with a rolled lip bottom edge to provide superior vacuum performance. The standard high-lift blade completes the package. The result is a manicured lawn even in moist lush conditions. Your customers will love the look of their lawn! Reduced Weight: The Bravo 21 was designed in a clever way to reduce weight to a minimum while still retaining professional durability. CAD design software allowed us to remove excess material from components without compromising strength. Aluminum was chosen over steel for the handles for the same reason. Superior Maneuverability: The Bravo 21 design is focused on easy and quick maneuverability with low overall weight, excellent front to back balance, and most importantly a narrowed top handle. The special handle shape allows for easier turns when working around plants, trees, fences, and other obstacles. Quick & Easy Catcher: The Bravo 21 has a large capacity catcher that is very easy to get on and off. You remove the catcher straight through the handles without any cables in the way. The catcher fills completely without clogging even in damp grass. The large capacity means fewer stops on each property. Excellent Commercial Value: The Bravo 21 has a very reasonable initial purchase price. When you compare all of the designed in features of this mower, including the Kawasaki commercial engine, we are sure you will agree, that the Bravo 21 provides the best dollar value for the commercial user. Reasonable Spare Parts Pricing: The Bravo 21 has very reasonable spare parts pricing. You will find the spare parts to be much less expensive than competitors. Parts are readily available from your Ybravo dealer or from Ybravo.com on the internet. Quick and Easy to Repair: The Bravo 21 is designed from the ground up to be easy to service, either for a dealer, or for the commercial user. Fewer total parts, common fasteners, and bolt on components all add up to simplicity. Repair instructions are available at Ybravo.com to make all service tasks understandable, easy, and quick. Engine Warranty: The Bravo 21 Kawasaki engine is covered by the Kawasaki full 3-year commercial use warranty. See Kawasaki warranty policy for complete details. Commercial Mower Warranty: The Bravo 21 is covered by a comprehensive 2 year warranty policy. The mower is designed and built to hold up to the toughest commercial conditions, and we back up the mower with a strong warranty commitment. You will get a mower without defects in materials or workmanship, or it will be fixed for free. 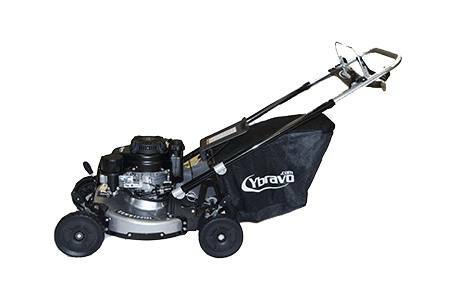 Residential Mower Warranty: The Bravo 21 is covered by a 5 year residential warranty policy. The mower is designed and built to hold up to the toughest commercial conditions, and we are confident that our mowers will provide years of service for the disconcerning residential user. You will get a mower without defects in materials or workmanship, or it will be fixed for free. Cutting Deck Width: 21 in. Wheels: Radial shaped 9 in. wheels. Fully interchangeable front and back. Ball bearings in front and fixed to transmission axle in rear. Upper Handle: Narrowed upper handle design for easier turning. Control balls fitted to handle for operator comfort. Specifications are subject to change without notice. Ground speeds are approximate measurements. 2018 Ybravo 25-210 Bravo Gen II 25"